Uglyworld #699 - Curiosity (214-365), originally uploaded by www.bazpics.com. "Wells you sees, the rests of us was sittings watching some tv's and there was a knocks at the door, so I goes overs to answers it and whens the door is onlys a tiny bits open a cat runs intos our room!". Now you see why I wanted Babo to explain it, as things always seem to make more sense when he tells them. Anyway, according to Babo the cat ran around like crazy in the hotel room and then sprinted straight back out the door. 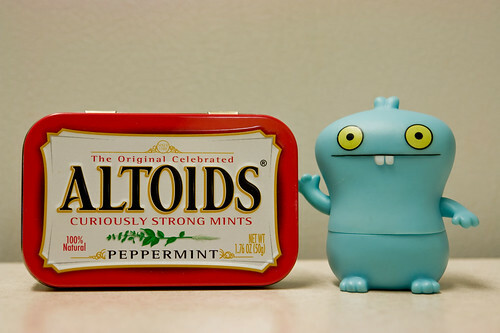 Babo decided that the cat needed to be caught, so today he picked up a tin of Altoids at the local supermarket, "You can sees what my plans is cants you?". Unfortunately I couldn't see it so I had him explain it a little more. "Altoids is well knowns for beings MEGA minty, ands they always says 'curiously' in their advertisings slogans, so I wants to use the logic of curiousity catched the cat". I loved the explanation so much that I didn't even point out that Babo got the saying a little bit wrong, so we'll see how his plan goes this week hopefully.